Eleven people have appeared in court in connection with an alleged plot to blow up several transatlantic airliners. Eight of those who appeared before City of Westminster magistrates in London were charged with conspiracy to murder and preparing acts of terrorism. Two were accused of failing to disclose information and a 17-year-old was charged with possessing articles useful to a person preparing terrorism acts. All 11 people were remanded in custody. They all deny the charges. Six of the people were remanded in custody until 4 September when they will appear at the Old Bailey. They were Tanvir Hussain, 25, of no fixed address; Umar Islam, 28, who gave his address in court as Stratford, east London; Arafat Waheed Khan, 25, from Walthamstow, east London; Ahmed Abdullah Ali, 25, from Walthamstow; Ibrahim Savant, 25, of Stoke Newington, north London; and Waheed Zaman, 22, from Walthamstow. They were charged with conspiracy to murder and with preparing acts of terrorism under section five of the Terrorism Act 2006. They denied all charges. They are also charged with conspiracy to commit murder and a second offence of preparing acts of terror. Assad Ali Sarwar, 26, from High Wycombe and 19-year-old Adam Khatib, from Walthamstow, appeared in the dock together also facing charges of conspiracy to commit murder and preparing acts of terrorism. They were again remanded in custody to appear at the Old Bailey on 4 September. No applications for bail were made. Another man, Mehran Hussain, from Chingford, east London, and Cossar Ali - a 23-year-old mother of an eight-month-old baby from Walthamstow, east London - were charged with failing to disclose information. They were remanded until 19 September. A 17-year-old boy, accused of possessing a book on bombs, suicide notes and the wills of people prepared to commit terrorist acts, was remanded until 29 August. 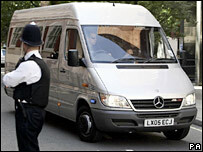 The 11 accused arrived separately at the court in vans with blacked-out windows, having been taken from Paddington Green police station to the court via an unnamed holding area. Meanwhile, one woman arrested as part of the police investigation into the alleged plot has been freed without charge and 11 other people remain in police custody. Announcing the charges on Monday, Susan Hemming, head of the CPS counter terrorism division, said the alleged plot was to "manufacture and smuggle the component parts of improvised explosive devices on to aircraft and assemble and detonate them on board". An initial 24 people were arrested following police raids in Walthamstow, east London, High Wycombe in Buckinghamshire and Birmingham on 10 August. Security at airports was increased, causing widespread flight cancellations in the UK for several days.